This morning we are back into our series on 1 Samuel. And today we begin a sequence of four stories that focus on the ark of the covenant, and which don’t even mention Samuel. These stories show Israel’s sad state at this time and God’s judgment on their unfaithfulness. And they also tell how Israel came to a place of repentance that sets up the narration of Samuel’s ministry in chapter 7 and beyond. Our story today is about a battle between Israel and the Philistines, starting in the last half of v. 1 of chapter 4. 1bNow Israel went out to battle against the Philistines. They encamped at Ebenezer, and the Philistines encamped at Aphek. 2The Philistines drew up in line against Israel, and when the battle spread, Israel was defeated before the Philistines, who killed about four thousand men on the field of battle. The Philistines were settled along the coast in five key cities. They were the archenemies of Israel at this time and were dominating them militarily (some of the Israelites were forced into servitude – 4:9). The battle took place in Aphek about 20 miles north of Philistine territory and about 20 miles west of Shiloh (where the tabernacle/temple was). Israel was encamped at Ebenezer, probably just East of Aphek. Israel suffered a great loss. When ancient peoples fought, as they saw it, it really involved a fight between the God or gods of the two nations. And so if you lost it meant that your god was defeated, or perhaps it would be interpreted that your god was unhappy with you. And this was certainly the case for Israel’s God, Yahweh – the only true God. The Lord God is all powerful, so he must have allowed this, as the Elders surmised. So the Elders of Israel come up with a plan. “Let us bring the ark of the covenant of the Lord here from Shiloh, that it may come among us and save us from the power of our enemies.” 4So the people sent to Shiloh and brought from there the ark of the covenant of the Lord of hosts, who is enthroned on the cherubim. And the two sons of Eli, Hophni and Phinehas, were there with the ark of the covenant of God. (One is justified in wondering why the Elders didn’t consult Samuel.) The ark of the covenant looked something like this. It was approximately 4x2x2 in size and covered in gold. (Exodus 25:10-22). On the top were two cherubim; angel-like creatures. It served as the visible throne of Israel’s invisible God. He sat, as it were, above the cherubim. As v. 4 says, the Lord, “who is enthroned on the cherubim.” (Also, Jeremiah 316-17; Isaiah 37:16; Psalm 99:1-3) In other places it is also called God’s footstool, which is also throne language (1 Chronicles 28:2; Psalm 99:5; 132:7). Now it wasn’t necessarily wrong to bring the ark. The ark was used in battle, for instance when Israel defeated the city of Jericho (Joshua 6). And the title for God here, “Lord of hosts,” refers to God as the leader of his armies, both human and angelic. The problem is that the diagnosis of their defeat is too shallow. In truth God allowed them to be defeated because of their unfaithfulness – which is highlighted here by the mention of “the sons of Eli, Hophni and Phinehas.” As we have already seen these two sons of Eli the high priest were publicly known, flagrant sinners. And Eli did not stop them from being priests while they broke God’s law. 5As soon as the ark of the covenant of the Lord came into the camp, all Israel gave a mighty shout, so that the earth resounded (or shook). Israel has new morale and boldness, because they think that God is now with them. [The shout here and the movement of the earth echoes the story of Jericho – Joshua 6:6-21]. And when they learned that the ark of the Lord had come to the camp, 7the Philistines were afraid, for they said, “A god has come into the camp.” And they said, “Woe to us! For nothing like this has happened before. 8Woe to us! Who can deliver us from the power of these mighty gods? These are the gods who struck the Egyptians with every sort of plague in the wilderness. Here their fears are on open display. They don’t quite get the details right – they talk about Israel’s gods and think the plagues took place in the wilderness, but they have heard of how Yahweh’s power struck the Egyptians. And now here is the visible presence of Yahweh, his throne, in the Israelite camp, which must have been quite unusual for the Israelites to do, at least with the Philistines, since they say, “nothing like this has happened before” – v. 7. They can only say, “Woe to us, woe to us.” This is certainly what the Elders of Israel had wanted, to put fear into their enemies. But then something suddenly changes, because they don’t stay afraid. After having said “Woe to us” twice, here they rally and call each other to “be men” twice. Instead of giving up, they decide that they need to fight harder than they ever have to overcome such a powerful foe, so that they don’t become the slaves of the Israelites. 10So the Philistines fought, and Israel was defeated, and they fled, every man to his home. And there was a very great slaughter, for thirty thousand foot soldiers of Israel fell. Even though they brought the ark, the Israelites suffered a much worse defeat, more than seven times the losses. The title today is “The futility of lucky charm religion” A lucky charm is something that you think has power to protect you and give you success. 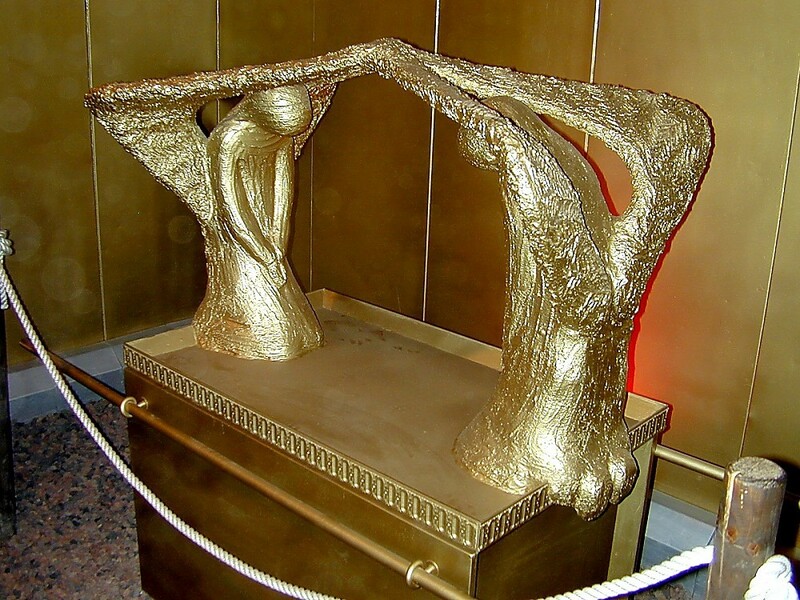 In Israel’s time of difficulty – a military defeat – instead of coming to God and repenting and moving into faithfulness, they treated the ark of the covenant as a lucky charm; as an object that would bring God’s power to protect them and give them success. Instead of right relationship with God, they went with a mere object that represents God to bring them the help they needed. I say “The futility of lucky charm religion,” because we see the results of this – their defeat was increased over seven-fold. This just isn’t how a relationship with God works. God and the things of God are not magical. God can’t be manipulated by us. It is God who is important above all else, including the ark that represents him. And right relationship with God is important above all else – and not other things that represent God to us. – in this story. Sometimes we act just like these ancient Israelites. We are not walking in right relationship with God; we are unfaithful to God. And when God disciplines us with hard times for this – instead of dealing with the real issue – our unfaithfulness (hey, the problem can’t be with me! ), we look to things that are connected to God and think that these will guarantee that God will take care of us. Perhaps coming to church is a lucky charm for some. You are walking sin, but think, “If I go to church I believe God will take care of me.” Well, going to church is great. But it can’t take the place of repentance and walking in a right relationship with God. Perhaps it’s calling yourself a Christian. You are unfaithful to God, maybe you don’t even have a relationship with God, but you think, “If I identify as a Christian God will take care of me.” Identifying as a Christian is wonderful. But it can’t take the place of having a right relationship with God. Calling yourself a Christian is not a substitute for actually being a real, faithful Christian. Maybe it’s wearing a cross or having a cross or a crucifix on your wall. There is nothing wrong with this. But jewelry or artwork that represents God will not save you in the day of trouble. Only being in a right relationship with God can do this. None of these things are wrong, just as it wasn’t wrong to bring the ark. They are wrong only when we make them substitutes for dealing with the core issue of our sin and unfaithfulness. And given our undealt with unfaithfulness, we turn these things into lucky charms which can’t protect us and take care of us. No, God is patiently waiting for you to turn from your unfaithfulness and come into a right relationship with him through confession of you sins, repentance and finding forgiveness. And then God will make his power and love known to help you and take care of you.